Trump Threatens Up To 25% Tariff On Apple Products - Joe.My.God. President Trump signaled in a Wall Street Journal interview that he is expecting to place tariffs on all Chinese imports, including potentially the iPhone and other Apple products, if negotiations at the upcoming G20 summit with President Xi Jinping fall through. “I can make it 10 percent and people could stand that very easily,” Trump said of price increases resulting from possible tariffs on iPhones, Macs, and other devices. The U.S. is set to raise tariffs from 10 percent to 25 percent on $200 billion of goods imported from China beginning on January 1, though Chinese officials at G20 are expected to try to dissuade Trump from this plan. 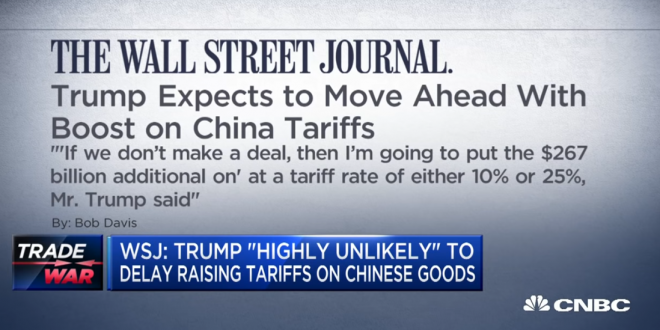 Trump, however, told the Journal that it is “highly unlikely” that China will be able to sway him. Such a move would hurt US consumers and American companies because the taxes would be levied on the goods when they enter the country. Apple would have to decide whether to raise its prices to compensate. “The direct impact would be in the United States,” said Bryan Ma, analyst with research firm IDC. “If push comes to shove, 25% on a $1,000 phone is not a joking matter, regardless if Apple absorbs some of that or if it’s largely passed onto the consumer.” Trump said the tariff level could either be 10% or 25%.